US President Trump unorthodox methods keep working like a charm for him. EUR/USD weekly forecast anticipates a modest recovery in the common currency is still likely. The common currency retains the dubious honor of being among the weakest currencies across the FX board, as despite dollar's weakness ruled throughout the week, the EUR/USD pair ends it barely up in the 1.1550 region. 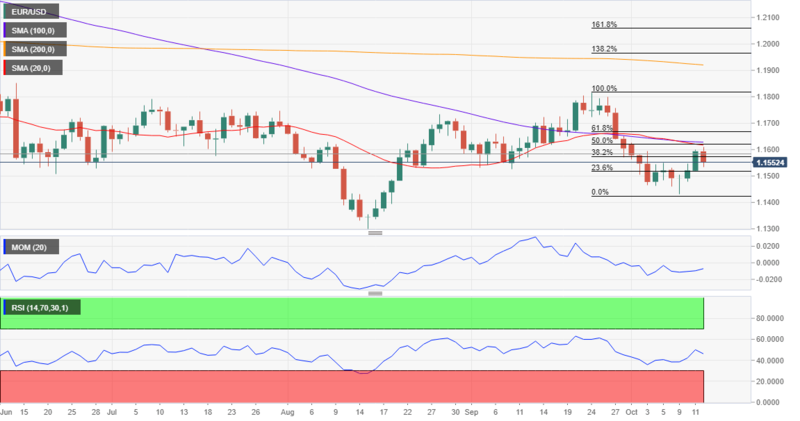 The pair peaked at 1.1610 and bottomed at 1.1431, a fresh 7-week low, as Italian political woes dominated the pair at the beginning of the week. Things changed Wednesday, in a mixture of renewed trade tensions and comments from US President Trump, which displaced the Italian budget issue. Market's turbulence was caused by US yields soaring to multi-year highs, and Trump again going against Powell & Co. In an interview offered Wednesday, he said that "the Fed is going loco and there’s no reason for them to do it. I’m not happy about it,” as soaring US yields put Wall Street in sell-off mode. His words, were good at least for yields to retreat sharply, although the turmoil in the financial market's persisted. This Friday, things seem a bit more quiet, with the DJIA recovering some 300 points after shedding around 1,400 in the previous two days. Whether the US President is able or not to dictate the Fed's decision, became irrelevant, as interest fell big just following his words. Whether the world likes or dislikes him, is also irrelevant, as he is getting things done, maybe with the most unconventional methods ever since, but done anyway. Adding to dollar's jitters mid-week, US inflation for September disappointed, rising but less than expected up barely 0.1% MoM and retreating to 2.3% YoY after printing 2.7% in August, while this Friday, the preliminary estimate for October Consumer Sentiment as measured by the Michigan University came in at 99.0, retreating from 100.1, and below the expected 100.4. Next Monday, the US will release September Retail Sales, seen up 0.5%, granting an entertained start to the week, while Germany will release the ZEW survey on Tuesday, and the EU September inflation on Wednesday. There are plenty of other figures coming out, but none of them as relevant. Politics have largely overshadowed macroeconomic figures, mostly because these lasts indicate that most major economies are in a healthy growth path, and central banks tightening, or in their way to do so. Seems this scenario won't change anytime soon. The pair's weekly high coincides with the 50% retracement of the previous weekly decline and has now stabilized below the 38.2% retracement of the same decline, which keeps indicating that the upward potential is well limited. In the weekly chart, the pair is resting around a bullish 100 SMA, while the recovery stalled below a still bearish 20 SMA. Technical indicators in the mentioned chart remain within negative levels but lack clear directional strength. All in one, more slides could be expected. In the daily chart, the 20 and 100 DMA converge with the mentioned Fibonacci resistance that contained the weekly advance, while the 200 DMA maintains its bearish slope some 300 pips above the current level. Technical indicators in the same chart have resumed their declines within negative readings and after correcting oversold conditions, also indicating that the risk is skewed to the downside. 1.1460 is a strong static support area, and if pierced ahead, the pair can retest 1.1400, while below this last, 1.1320/40 is the next probable bearish target. An immediate resistance comes in the 1.1620 area, but the pair needs to firm up beyond 1.1660 to actually have chances to extend d its recovery toward the 1.1730 price zone. The FXStreet Forecast Poll shows that confidence toward the greenback has deteriorated, as most currencies are expected to appreciate against it next week. In the case of the EUR/USD pair, bulls are a majority in the weekly perspective, with 59% of the polled experts beating on a raise and targeting on average 1.1584. For the monthly view, the sentiment is mixed, while bulls re-take control in the 3-month perspective, up to 47% and with an average target of 1.1567. The overview chart, however, offers a neutral-to-bearish stance for the two first time-frame under study, with the moving average in the 3-month estimate offering a tepid bullish slope, with most targets in this last time frame accumulating above the current level.